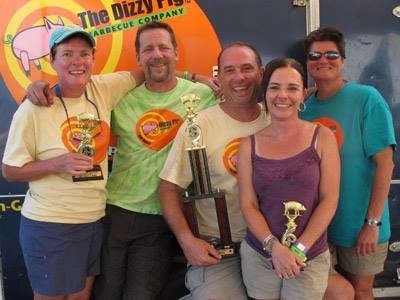 The Dizzy Pig crew full of smiles after a well deserved Grand Champion competition. For the past couple years we have always left Pickin’ in the Panhandle empty-handed. This caused us to really second guess competing in West Virginia this year, but after some discussion we decided to give it one more try. Our results were eerily predictable. Actually, our scores were all over the place, which seems to be the trend for us and others this year; however, our overall placing was 16th … in 2012 it was 15th … in 2011 it was 14th … It doesn’t take an analyst to see we are trending in the wrong direction here! Ok, we all know that one place here or there is simply the name of the game in competition BBQ, so actually this shows we’ve been very consistant overall in WV, it’s just too bad that it’s consistantly out of the top ten. Next year we could be easily convinced to seek another competition during this week. 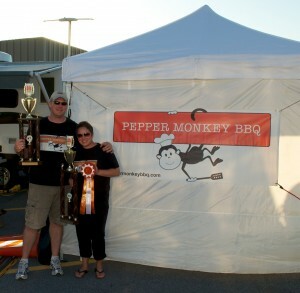 We did manage to get two calls at awards, 9th place chicken and 8th place pork. Our ribs hurt us at 29th and brisket was not muvh better at 26th. We were 16th overall out of 37 teams, but it wasn’t because the rub we were using wasn’t the best there is! We did get a chance to celebrate a victory this weekend when our sponsor and good friends of the Dizzy Pig crew heard their name three different times: 1st place ribs, 2nd place pork, and GRAND CHAMPION! 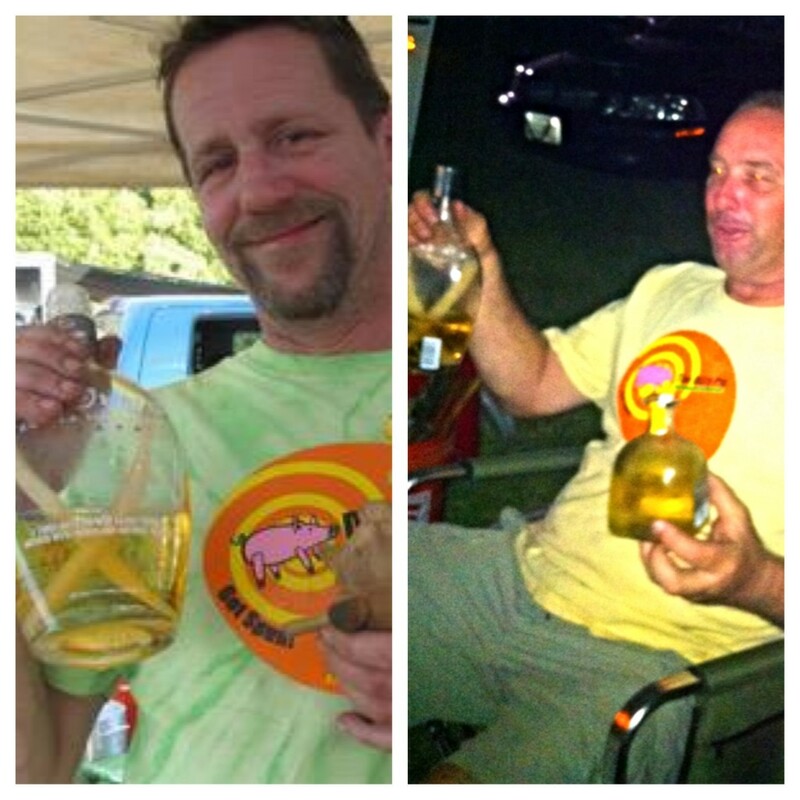 These guys did an awesome job and hopefully they will be cooking at ‘The Jack’ in 2014. We had a great time cooking adjacent to them (except for that stupid fence they had in between the teams) and really enjoyed celebrating late into the night on Saturday. Some people really know how to celebrate a GC! We opted to cook at an Eggfest instead of cooking at Shenandoah this year, so the pressure will be off for a couple of weeks, then we are going to build on our record for most comps in a season and do three back to back cooks in October, starting with the Keystone Classic in Harrisburg, PA. Really hoping to finish strong this year after a summer of ups and downs. Dizzy Pig, Dizzy Pig, Dizzy Pig! We are Joel and Erin Matteson, the master minds behind Pepper Monkey BBQ. We are here to dispel the theory that BBQ is specifically a sauce, spice and rub kinda cooking. Our cooking centers around the use of our beloved Big Green Eggs. Their unlimited potential has changed our perspective on outdoor cooking. You will find us 'Egging' anything from brisket to bacon to salad to pie. If it can be cooked, it can be cooked on a Big Green Egg and we are going to take you on a dizzying ride of fearless cooking and barbecuing. To learn more about how we ended up here, read more on our "About Us" page.